Steve Jobs is quoted many times for his successes. Some of my favorites are from his 2005 graduation speech at Stanford University. They include the following: (1) You can't connect the dots looking forward; you can only connect them looking backwards. So you have to trust that the dots will somehow connect in your future. You have to trust in something - your gut, destiny, life, karma, whatever. This approach has never let me down, and it has made all the difference in my life. 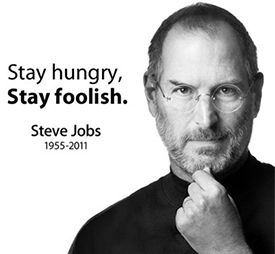 (2) Stay Hungry, Stay Foolish. (3) Your work is going to fill a large part of your life, and the only way to be truly satisfied is to do what you believe is great work. And the only way to do great work is to love what you do. If you haven't found it yet, keep looking. Don't settle. As with all matters of the heart, you'll know when you find it. (4) Have the courage to follow your heart and intuition. They somehow already know what you truly want to become. Everything else is secondary. Click here to open a new window asking how many times you need me to say "You're awesome! Everything is okay."